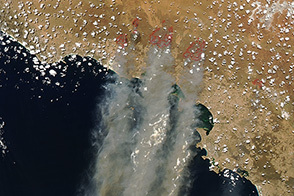 A crippling heat wave and strong winds in southeastern Australia contributed to an outbreak of forest and grassland fires in Victoria in late January 2009. By January 30, about 5,500 hectares had burned and at least 10 homes had been destroyed, reported the Australian Broadcasting Corporation (ABC). The homes were located in a small community near the town of Boolara. Nearly surrounded by wildfire, the town had also run out of water and lost power, said ABC News. This image from the Moderate Resolution Imaging Spectroradiometer (MODIS) on NASA’s Aqua satellite was captured on January 30. 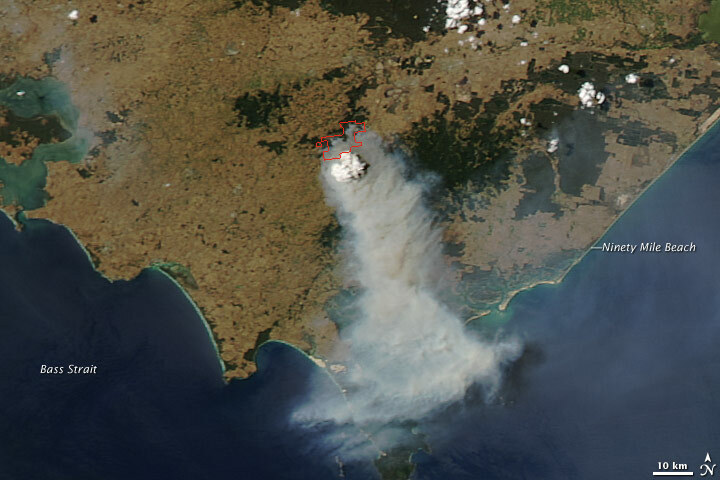 A large plume of smoke spreads southward from a fire (outlined in red) that appears to be burning in a small area of forest west of Churchill (a larger town near Boolara) in Victoria’s Gippsland region. The forest is dark green in contrast to the surrounding grass or cropland. The fire, says ABC News, started as two blazes in plantation forests in the Strzelecki Ranges. The large version of the scene shows a wider area that includes several other fires. The high-resolution image provided above is at MODIS’ full spatial resolution (level of detail) of 250 meters per pixel. 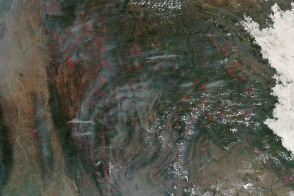 The MODIS Rapid Response System provides this image at additional resolutions. NASA image created by Jeff Schmaltz, MODIS Rapid Response Team, Goddard Space Flight Center. Caption by Rebecca Lindsey. 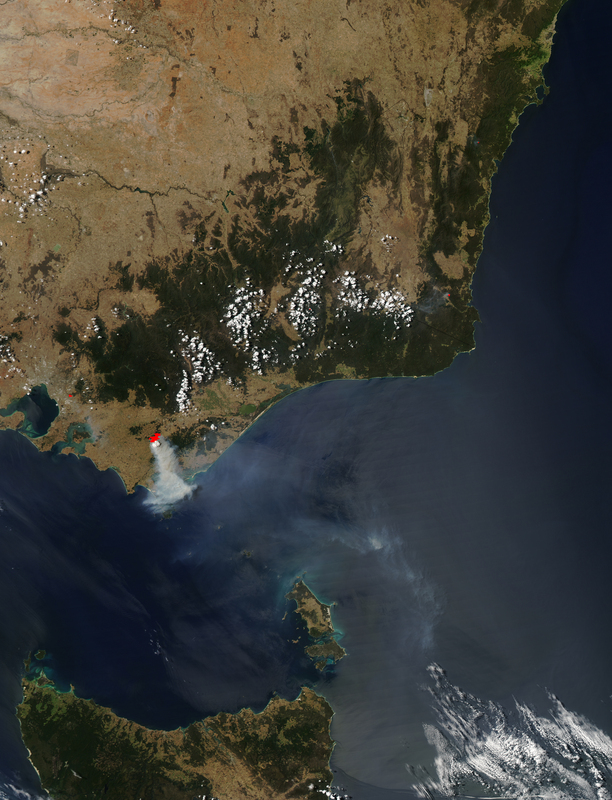 This image of the Gippsland region of Victoria, Australia, shows a large fire billowing a plume of smoke toward the Bass Strait on January 30, 2009. Australian Broadcasting Corporation News. (2009, January 30). Gippsland fires rage despite cool change. Accessed January 30, 2009. Australian Broadcasting Corporation News. (2009, January 30). Vic blaze destroys homes as town runs out of water. Accessed January 30, 2009. Australian Broadcasting Corporation News. (2009, January 30). Vic fire crews welcome easing weather conditions. Accessed January 30, 2009.